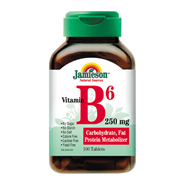 Vitamin B6 helps regulate fat, carbohydrate and protein metabolism. Essential for diets rich in protein. Important for proper functioning of the immune system and hormone balance. Each tablet contains: Vitamin B6 (Pyridoxine Hydrochloride) 250mg.